We used carrots as a model crop to study varieties, handling and storage options for long-term storage. Below are some findings from our study of six different varieties of storage carrots. 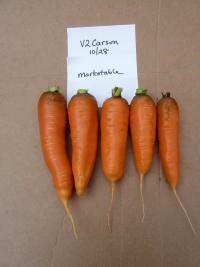 For the 2011-12 season, we used six carrot varieties (Berlanda, Brest, Bolero, Carson, Deep Purple, Florida). Carrots were seeded July 26 and thinned to 1 inch on August 24th. We harvested carrots on three dates (November 3, November 14, November 28). We measured wholesale and direct sale marketable weight, counted culls, and measured dimensions of carrots (length, width, pith width). At harvest, carrots were sorted into marketable and unmarketable, based on the USDA United States Standards for Grades of Topped Carrots U.S. No.1 and U.S. No.2. Those that were in good condition but too small or moderately misshapen were included in direct sale marketable weights. We measured Brix score (a measure of sugar content) at the time of harvest, and again after 6 months of storage. For three of the varieties (Berlanda, Bolero, Brest), we stored half of the carrots washed and half unwashed. We then evaluated staining, presence of rot, and top sprouting, after 6 months of storage. Brix score (sweetness) was higher for the two later harvests (November 14, November 28) compared to the first. Marketable weights were also higher for the later harvests. In general marketable weights were lower than in 2010, likely the result of a later seeding date and cool wet fall. Stored carrots were sampled in April for rot, staining, and top sprouting (an indication that they are becoming biologically active). After six months of storage, they no longer retained flavor and were unmarketable. However, their reaction to extended storage serves as a good indication of how they would react to storage over shorter periods. We found that washed carrots were more than twice as likely as unwashed carrots to show signs of rot (35% versus 14%), although rot damage was quite minor in all carrots. We saw no differences in top sprouting between washed and unwashed carrots. Unwashed carrots did show minor to moderate staining, and did not wash completely “clean.” However, washed carrots that were not kept perfectly clean (i.e. not all dirt was washed off pre-storage, small amount of dirt left in bag) also showed minor staining. We saw differences between varieties in terms of levels of staining, rot, and top sprouting (see variety descriptions below). There were no significant differences in Brix score between washed and unwashed carrots. 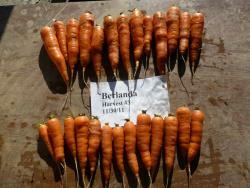 In 2011-12 trials, Berlanda was the highest yielding variety, both in terms of numbers and weight of wholesale marketable carrots. Brest, Bolero, and Florida were also high producers. Carson and Deep Purple did not fare as well, with Deep Purple producing less one third the marketable weight of Berlanda. 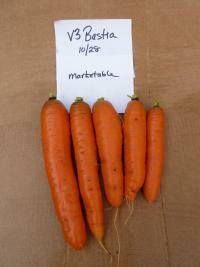 These low yielding varieties produced approximately an equal weight in direct sale marketable carrots. Higher yielding varieties produced additional direct-sale carrots equal to about 2/3 of wholesale weights, and were still by far the best producers even for direct sales. With regards to response to long-term storage, Brest had the lowest levels of staining when stored unwashed, but high levels of minor rot, and sprouting of tops. Berlanda showed the highest levels of staining, but only modest levels of rot. Bolero showed very low levels of top sprouting. The numbers below are the average of three harvest dates, using the more lenient criteria for marketability in direct markets. BERLANDA (85 days) Dark orange, cylindrical, 9" Berlikum with good tops. Source: Bejo. BOLERO (75 days) Medium-long, 7-8" roots are uniform, thick, slightly tapered, and blunt, with a medium core and average internal color. This Nantes has good taste fresh, and after long-term storage. Resistant to Alternaria and Cercospora blight. Heavy, tall tops. Source: Johnny’s. CARSON (90 days) Early Chantenay, 7 1/2" deep orange, conical roots, with broad shoulder, blunt tip, and strong, tall tops. Source: Bejo. BREST (90 days) Dark orange, full season slicer, with cylindrical to slight taper. 9" roots carry weight to the tips. Excellent tops for mechanical harvest. Source: Bejo. 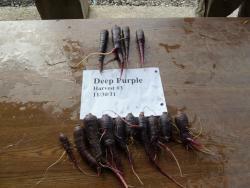 DEEP PURPLE (80 days) Dark purple, 7-8" tapered roots with sweet flavor, similar to Purple Haze. Tall, strong, healthy tops. Color fades when cooked. Source: Bejo. FLORIDA (95 days) Cylindrical, orange 9" roots are sweet, with good tops for mechanical harvest. Very productive. Source: Seedway.